Welcome to our February Curriculum Update. Whilst it is very cold outside, it is hotting up in the classroom as we prepare our students for the next phase of their educational journey. The curriculum at Chelsea Academy is incredibly important to ensure the best future for our students. 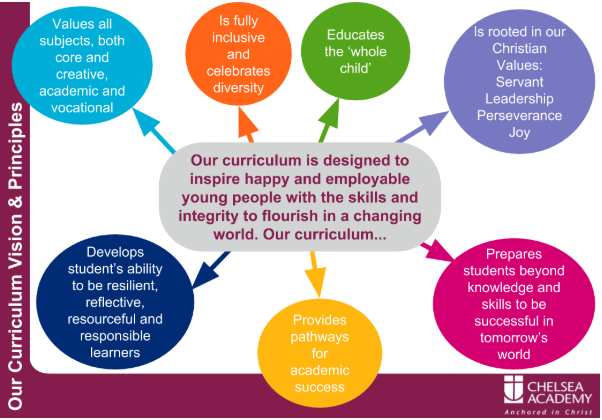 Our curriculum vision is below. It is our goal to inspire our students and enable them to flourish in a world that is ever changing. Think back to when you were at school, were some of today’s jobs in existence back then? Deliveroo, Uber, Social Media Analysts and so on. Also consider today’s artificial intelligence. Robots used to replace the brawn and now will replace the brain as many jobs are being replaced by computers and systems. Having said that, we still need young people in society to be creative and to be critical thinkers, to collaborate with others and communicate effectively with the skills and knowledge provided by new and traditional curriculums across the world. With all of this in mind, at Chelsea Academy we are constantly reviewing our curriculum. We have realigned our values and vision and have illustrated this below. It is incredibly important for us as an Academy to provide your children with the best possible education possible. We are one of only 16 World Class Schools in the country and our curriculum is one reason why. What does this mean for my child at Chelsea Academy? Well, firstly, if they are in Year 8, soon they will be making decisions about their option subjects. This year we will have a new revised offer to best prepare them for tomorrow! If your child is in other year groups, lessons and content in the future will be designed around providing not only the best outcomes but also the best skills and qualities to succeed in tomorrow’s world. 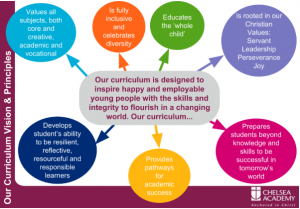 As part of our curriculum offer is our extended curriculum. This is the curriculum that takes place outside of lesson time but can have a huge impact on an individual. Music, Sport, Science, Architecture and many other sessions are held to inspire and develop our students in areas not covered directly within the National Curriculum. We have a number of activities available before and after school and also at lunch time. Please have a look at the Spring Timetable linked here for more information. As we move nearer to the summer’s GCSE exams, there is a huge amount of support being offered to year 11 students at the Academy. This includes an extensive program of after school revision sessions. 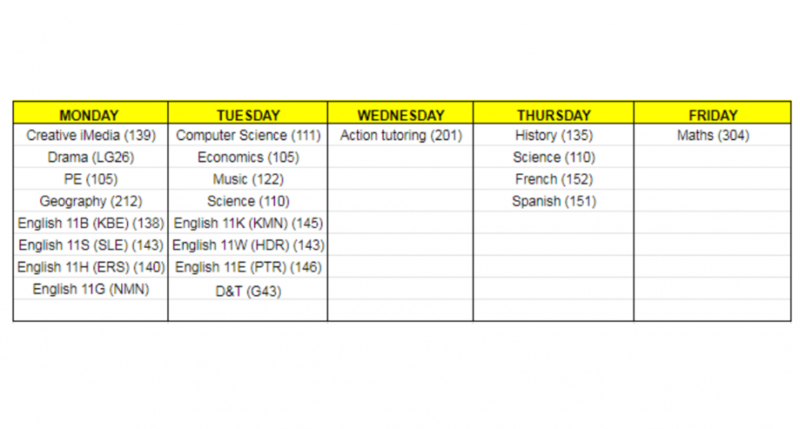 The timetable below shows which sessions are offered each day. There are also other session organised by subject areas so do ask your son/daughter to speak to their teachers and find out what they can do to continue to improve in the run up to exams!